As I confessed in my memoir, Insatiable: Tales from a life of Delicious Excess, dinner and dancing were my drugs of choice…that’s why I am able to remember the Seventies so vividly. My hangovers were mostly fatigue from burning the candle at both ends. 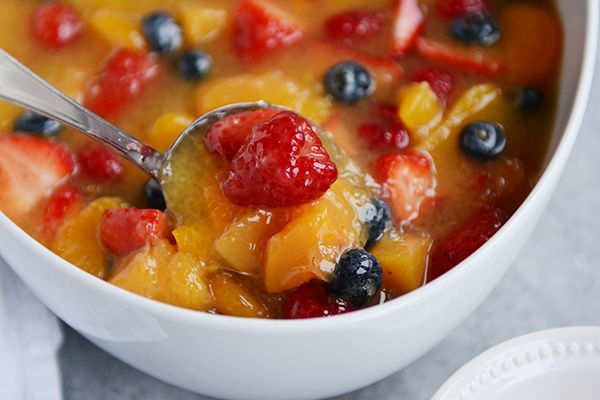 I don’t remember where I got the recipe for this refreshing and delicious fruit soup – always soothing after a wild night or a welcome waker-upper at my brunches for friends. If I stole it from you, please forgive me. Mix the instant tapioca into water in a small saucepan. Cook over medium heat, stirring constantly, until it comes to a full boil. Remove from heat. Add sugar, salt, and orange juice concentrate. Stir to blend. Let cool for 15 minutes, then stir again. Cover and chill for at least 3 hours. Just before serving, fold in fruit. In winter, you can use orange sections with the membrane cut away, sliced bananas, half grapes (seeded), frozen and thawed peach slices, and the best berries you can find. In summer, you can choose a mix of sweet and tart summer fruit—plums, peaches, nectarines, and, most especially, berries. Don’t forget the banana. Serve in chilled bowls or balloon goblets. Click here for my Recipe Archive.